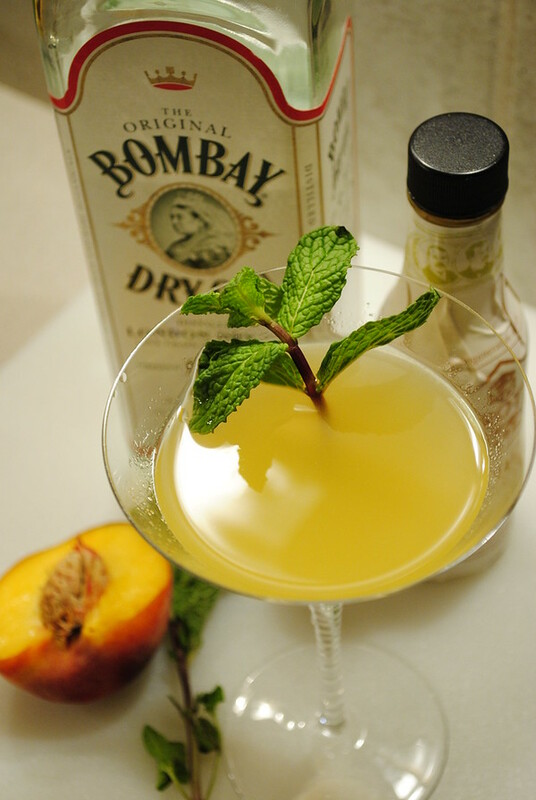 The hallmark of the gin branch of the family is the three-way flavor blend of gin, mint, and peach. Stir and strain into cocktail glass. Serve with olive. Serve with olive? Really? I’m trying to figure out how McElhone presented this drink. He specifically says “serve,” not “garnish,” which suggests that the olive (or olives) occupied a side dish. It was, perhaps, an eccentricity of Mr. DeGastreaux, or a local custom from Cincinnati bars, and amused McElhone enough that he recorded it for posterity. We’ll never know. 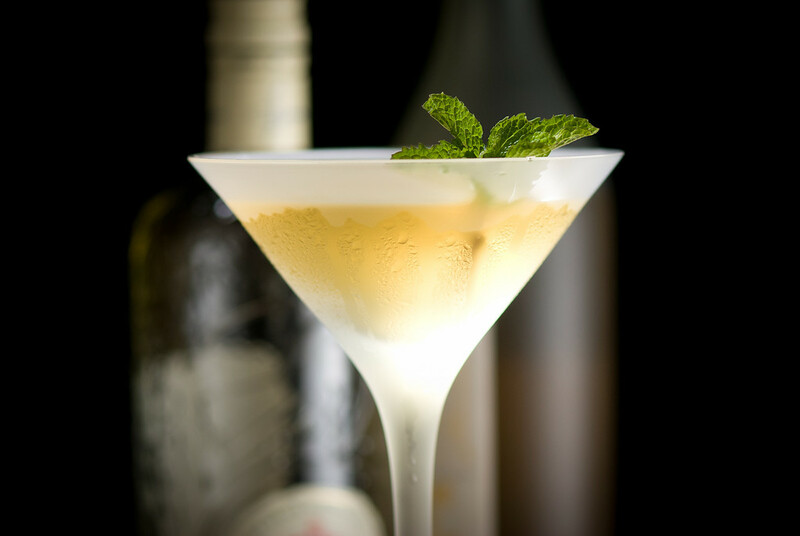 Meanwhile, there is no mention of muddling, and stirring wouldn’t infuse much of the mint flavor into the gin, so perhaps the mint was meant to be the garnish, a treat more for the nose than the tongue? It’s a mystery to me. Fee Brothers and Bitter Truth seem to be the most readily available commercial peach bitters in the American market. Either way, these bitters present a sweet, simple mix, with a very fruity, peachy nose, an initial impression of peaches and sugar, and the classic lingering stone-fruit flavor of bitter almonds. Far from bitter, the effect in this drink is an overall impression of sweetness. As a result, you’ll want to drink this Derby while it is really, really cold; as it warms, the bitters overpower the other flavors and the almond peachiness becomes too heavy. The bottom line: this is not a very good version of the Derby. It’s just sullied gin, utterly lacking character, with nothing to redeem it. I won’t do that again. In a mixing glass, muddle the peach, mint, and peach bitters. Add the gin and ice; shake well and strain into a small martini glass. Garnish with sprig of fresh mint. DeGroff solves the mint ambiguity of the McElhone and Craddock recipes by explicitly muddling the mint in the mixing glass, and adding a sprig as garnish. This version is very fruit-forward, with the fresh peach overrunning all other flavors and rendering the gin nearly invisible. It depends, I suppose on the type and quality of peaches used, but I found the drink to be better balanced with half as much fruit. I didn’t have peach liqueur at hand, so I went with peach bitters, with considerable reservation after my experience with McElhone’s recipe. I cut way back from that quarter ounce, and I think it improved the flavor. The aggressive peach flavor absorbs a considerable amount of mint, but I recommend that you handle the mint fairly lightly; I’d leave it out of the muddle altogether, and add it very late to the shake, so you don’t just end up with green shreds and mush. Better yet, you could chill the Derby by just rolling the shaker back and forth gently to avoid excessive crushing and bitterness. Stir or roll with ice; double strain into a well-chilled cocktail glass. Garnish with mint. The complexities of the aged genever and the peach cognac raise this version above the others. The flavors are rounder and denser. And you don’t have to wait for peach season to make this one. In Minnesota, that counts for a lot. Outliers: There are various versions of the Derby that don’t fit into the two main families. They range from really boring ideas like Peychaud-bittered gin to a much more interesting second listing from Embury, a cognac-based cocktail with bitters, curaçao, and pineapple syrup, topped with champagne. And Frederic Yarm recently published a variant called the “French Derby,” mixed by Scott Holliday at Rendezvous, in Boston. It’s a gin-based variation that substitutes pear liqueur for peach. “The Derby Cocktail, gin and peaches” at cold-glass.com : All text and photos copyright © 2011 Douglas M. Ford. All rights reserved. A stirrer with a horse shoe would be perfect. I remember plastic ones about 7 inches long 50 years ago but not the source. Sounds delicious! Can’t wait to try it and just in time for summer!